Taiwan has advance health care which costs less than most developed countries. In the recent decade, due to the push of globalization, and the need for industrial transformation and that of our diplomatic allies, our international medicine activities including medical travel and medical tourism are booming. But the provision of cross border health care involves complex issues of international law and conflict of laws. 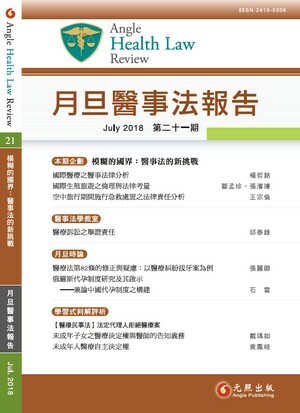 This article’s scope is limited to the issues that have already been regulated by administrative law and regulations domestically. The health law analyses focus on the aspects of inbound and outbound patients, the export of health care in international aid, etc.